"Please let me live. Please let me live." The fierce public debate over the recent execution of Stanley "Tookie" Williams demonstrates how visceral the discussion over capital punishment remains in this country, and even the most ardent defenders of the practice would have to admit that our system is an imperfect one. The sheer number of those sentenced to die, combined with legal incompetence and newly available scientific testing, suggest that there's got to be someone on death row who shouldn't be there; even if you don't believe that execution is barbaric (and I believe that it is barbaric), there's no denying that it's the one legal sanction that's irreversible. 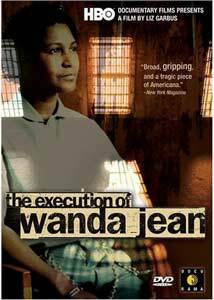 The case of Wanda Jean Allen, the subject of this documentary, exposes many of the weaknesses in our legal system, and the calls for blood, the desire by some to turn our prison system into a series of charnel houses, brings to mind Romans 12:19: "Vengeance is mine; I will repay, saith the Lord." The facts of the case aren't in dispute: in 1988, Wanda Jean Allen shot and killed her girlfriend, Gloria Leathers, after a domestic dispute. Seven years earlier, in another episode of rage, Allen committed a murder—she and Gloria in fact met in prison. So what could possibly mitigate the evidence against this twice-convicted killer? Well, testing indicated that, with an IQ of 69, Allen is borderline retarded; damage to the parietal lobe of her brain left her without appropriate and typical impulse control, and years before her murder of Leathers, a state psychiatrist stressed that failure to provide proper supervision for Allen could lead to horrific and tragic circumstances. Which is exactly what happened, suggesting that Allen should not have been left to her own devices, and that the failure here was a systemic one. In her last days and hours, Wanda Jean Allen's life became the proverbial media circus, with reporters from Time Magazine, news crews from CNN, and an appearance by the Rev. Jesse Jackson—but it's a mark of Allen's diminished mental capacity that what's on her mind is getting a bag of chips. There's no justifying or excusing her murderous actions, but the unspoken and painfully true point of this documentary is that we're all that much poorer, spiritually and emotionally, by this sort of state-sponsored killing of someone so obviously impaired, and that our collective failure to provide for her needs at an appropriate time had brutal though entirely predictable consequences. Image Transfer Review: The transfer is reasonable enough; the movie seems to have been shot entirely on high-end video, so there's subsequently a good amount of contrast. Audio Transfer Review: Audio is passable, though on some of the location shoots, the high level of static can make for some unpleasantness. Extras Review: Aside from Docurama trailers and info, the only extra is a brief biography of director Liz Garbus. The Execution of Wanda Jean refrains from preaching about capital punishment, but in its close study of one morally excruciating instance, it points up the flaws in a system designed for revenge and rehabilitation, and in fact offering neither. It's a passionate and well-made documentary, using one woman's sad story to illuminate a public debate in which the stakes are literally life and death.